It only takes spending a few hours on your feet to appreciate the simple technology of a chair. But for people with occupations that require shifts of non-stop standing, the opportunity to take a seat is often hard to come by. To solve this, a group of Japanese designers have developed a wearable chair that straps to a person's legs to provide them with quick relief wherever they stand. 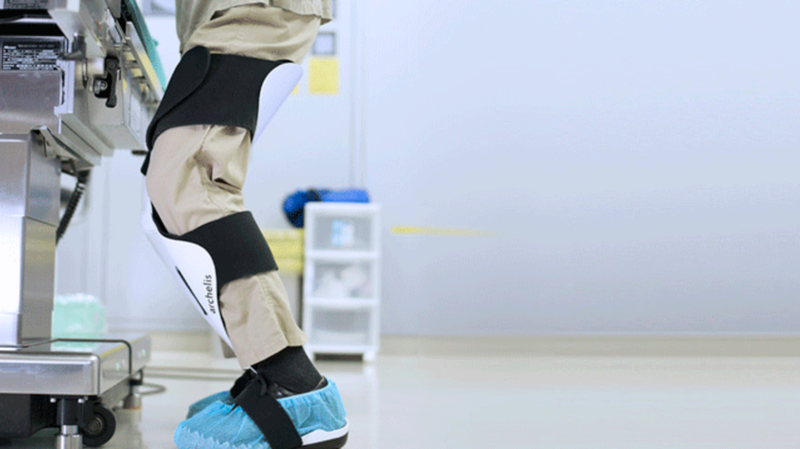 The device works like a leg brace and is flexible enough to allow people to walk around while they have it on. Whenever they need to take a break from standing, all the wearer needs to do is relax their legs and the chair will lock into place and support them. Archelis, or “walkable chair” in Japanese, was created by the mold-factory Nitto in collaboration with Hiroaki Nishimura Design, Japan Polymer Technology, and Chiba University’s Center for Frontier Medical Engineering. Though it may seem like a perfect fit for tired baristas or crowded subway commuters, the chair was originally designed to be used by medical professionals. Surgeons are sometimes required to stand for hours while performing operations, and in that profession, one sleepy mistake could mean the difference between life and death. You can check out video of doctors testing out the wearable chair below. The product is expected to become commercially available this summer.